We get a lot of questions about our handpan building process from customers and workshop guests. “How do you tune it?” is common, as is “How long does it take to make one?” The answers we often give are “Magic!” and “Around five years.” But all joking aside, as professional handpan builders, we’d like to answer the question “How is it tuned?” by broadening the scope of our response. We don’t “just tune”. We are actively invested in expanding our set of best practices and processes to build the highest quality instruments possible. 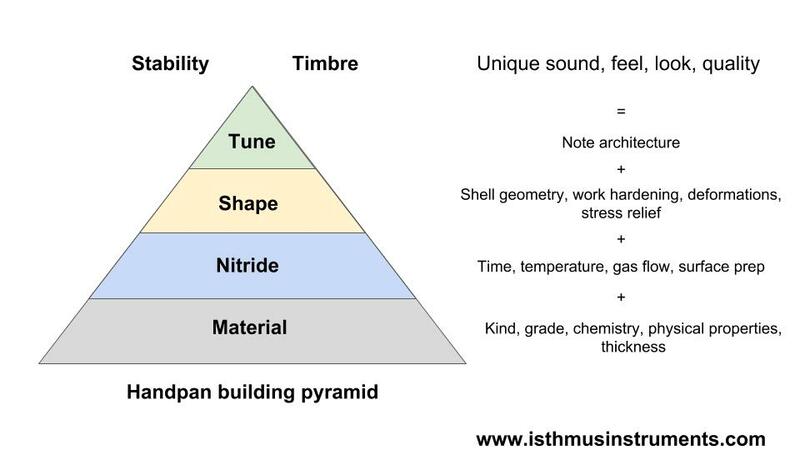 In the diagram below, tuning is at the top of our building quality pyramid. The diagram also describes important elements that underly tuning and which are inevitably linked. Other aspiring builders may find this framework useful in thinking through the variables in the tuning process. So let’s go ahead and look at what makes this pyramid have a solid foundation. Material selection is at the base of the pyramid because it is extremely important. It will affect all of the subsequent steps in the building process. Material selection requires an understanding of steel kind and grade, as well as chemistry and thickness. There are thousands of grades of steel to choose from, and even more options arise when you start to consider selecting for physical or chemical properties. Unfortunately for the handpan builder, steel industry standards and tolerance ranges are quite wide, and thus not necessarily well suited for reproducing tuned steel instruments. When builders select for a particular steel, that selection inevitably takes time, trial, error and research. We carefully source our steel to meet the specifications of our building process. 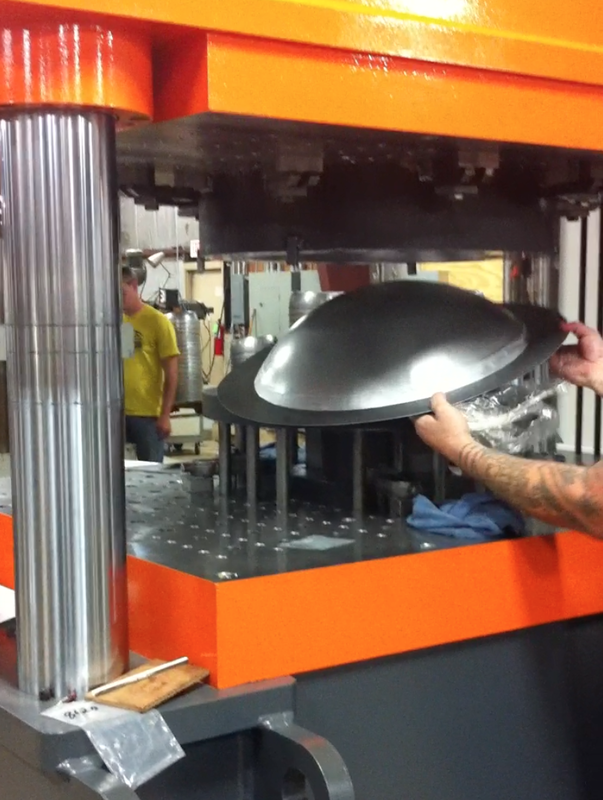 Our proprietary tool at work with our local stamping company. Our resulting and unique shell geometry, prior to nitriding. The next building block that helps us answer the question “how is it tuned?” is nitriding. Nitriding is a heat treatment process that increases resistance to rust while also changing physical properties of the steel. The gas nitriding process requires a furnace with precise controls for time, temperature, gas and pressure. Selecting the appropriate material in the first step will allow the nitriding process to achieve the best results. The measurable physical changes will subsequently affect shaping, tuning and the resulting timbre of the instrument. It takes a wealth of knowledge to work with nitriding companies to develop a specialized instrument-focused nitriding process. We have developed and adapted our nitriding recipe for years. 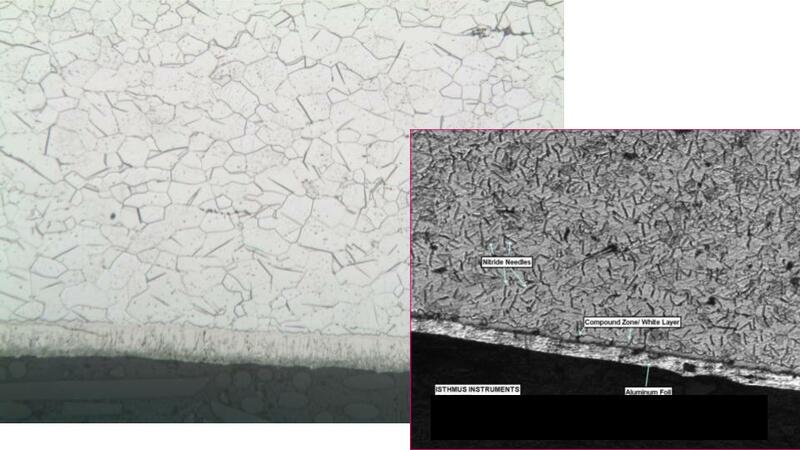 Here are some old microstructure pictures that depict a lightly nitrided steel sample in magnified cross-section. Visual inspection shows nitride needles lightly crossing grain boundaries and the formation of a “white layer”. A white layer is a visual signature of the nitriding process, is a barrier to rust, and is a subject of active exploration at Isthmus Instruments. Stay tuned for Handpan Tuning - Part 2 (Shaping & tuning) . Stainless Steel vs. Nitrided Steel? What's the difference?